On the 4th June 2005 one of Aberdeen Wing�s Civilian Instructors, (and an ex cadet) Di Gilbert, stood on top of the world. Di returned from Everest with one of her Russian Poisk oxygen cylinders and presented it to Aberdeen Wing for the creation of a trophy; the only criteria being it had to be for adventure training and it had to represent the same spirit of adventure that saw Di standing on the summit of Mount Everest. And so the idea of The Scottish Poisk was born. For full details and picture see the Scottish Poisk page. 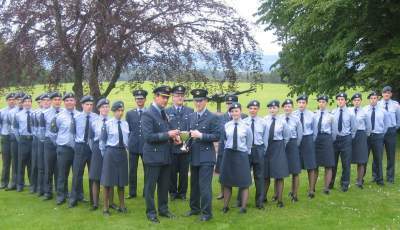 The Lady MacRobert Memorial Trophy is contested by all squadrons in the Aberdeen and North East Scotland Wing who are judged on many criteria such as efficiency and achivements each year. For the fourth year in a row this has been won by 107 (Aberdeen) Squadron with the runners up being 2367 (Banchory) Squadron. The trophy was presented in early June by Group Captain Roberts, Station Commander at RAF Lossiemouth to the Staff and Cadets of 107 (Aberdeen) Squadron. During his presentation speech Group Captain Roberts said the competition was very close this year and laid down a challenge to other squadrons to take the trophy from us next year. That will just make 107 (Aberdeen) Squadron all the more determined to hold on to it next year!